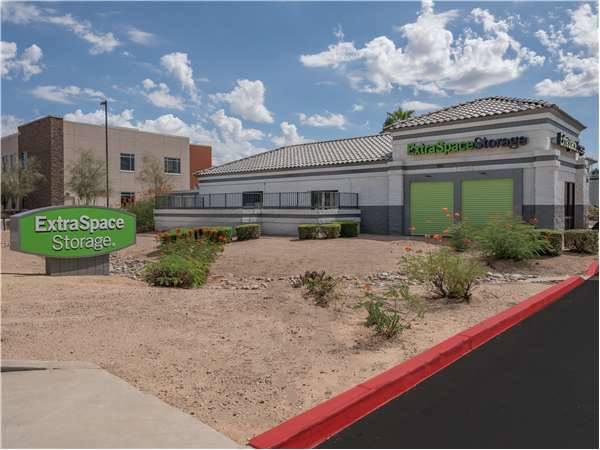 Located on W Chandler Blvd between N Pennington Dr and S Arrowhead Dr, Extra Space Storage serves residents of Chandler, Gilbert, Sun Lakes, Chandler Heights, Power Ranch, and more. Locals will recognize our facility next to Dignity Health Rehabilitation Hospital a few minutes west of The Home Depot. Extra Space Storage on W Chandler Blvd offers a large selection of storage units, air-cooled storage, vehicle storage, and exceptional security. We're your go-to storage solution in Chandler! Extra Storage has great employee's and our manager goes out of his way to be sure everything is the way you want it to be. Everyone is very energetic and helpful. The property is always clean and well kept! William was awesome and extremely detail-oriented when helping decide on a unit and all the details associated with it. Cleanest storage units I've seen! We needed a storage space to go through excess stuff that has accumulated. We rented from this facility when it was a different company years ago and it was horrible. We were pleasantly surprised to find out it's been completely remodeled and is neat and clean. The employees are friendly and helpful and knowledgeable. It was a great experience and I would recommend this facility if you're looking for storage! Rita was extremely nice and helpful even though I arrived right at closing time. She took the time to show me the unit I would be renting and explain all the details. I can't say enough good about my experience. I highly recommend this facility. The employee was very helpful, quick service, excellent service and at a convenient location. I recommend you rent from here. And the prices were great! No trouble finding my storage. I'm from out of state and will be starting a church and needed somewhere to store our things. Did a lot on line and received a call right away from a service rep who was also helpful! I'm so happy I found Extra Space Storage. The grounds and units are clean and well maintained. The office staff was very helpful and the check in and move in process was quick and easy. On Chandler Blvd, east of Dobson Rd. Drive south on N Alma School Rd. Turn right onto W Chandler Blvd. Make a U-turn on N Pennington Dr and continue east. Our facility will be on your right just before East Valley Rehabilitation Hospital. Drive north on S Alma School Rd. Turn left onto W Chandler Blvd. Make a U-turn on N Pennington Dr and continue east. Our facility will be on your right just before East Valley Rehabilitation Hospital. Drive west on W Chandler Blvd. Make a U-turn on N Pennington Dr and continue east. Our facility will be on your right just before East Valley Rehabilitation Hospital. Drive east on W Chandler Blvd. Pass Chandler Fashion Center and continue east. Our facility will be on your right just after N Pennington Dr.